It was in a classroom, after I had opened Technical Specification 36.101 for handset radio transmission and reception that I suddenly noticed for the first time something odd about Band 13. I said to the class without hesitation, Band 13 [UL = 777 MHz-787 MHz & DL = 746 MHz-756 MHz] has the uplink and downlink reversed! In contrast to all other FDD bands in the table (and many other bandplans elsewhere), in this band, the higher frequency is allocated to the mobile device and the lower frequency to the base station. The normal practice of FDD paired band allocation has to do with attenuation properties of the carrier frequency and the availability of the power. The mobile side has usually been allocated the “easier” lower-frequency portion of the band which experiences smaller amount of attenuation and therefore requires less power for closing the uplink. A reversal of this allocation strategy in band 13 is a sure sign that some other problem is lurking in the background, namely interference in the form of spurious emissions. The 700MHz band is divided into four paired blocks, A, B, C and D (an unpaired E Block is also available). The A and B blocks are guard bands. The C blocks (LTE Band 13) in this upper 700MHz band were the main object of last year’s auction. 12MHz in the middle of this spectrum belongs to the Public Safety. A look at the structure of the auctioned UHF band shows that upper portion of Band 13 is closer to the public safety band. In order to reduce the effects of interference to the public safety band and other bands due to intermodulation effects of this carrier, the higher more “difficult” frequency has been allocated to the lower powered handset. On the other hand we can expect a slight enhancement in indoor coverage for band 13, due to further lowering of the downlink frequency .The question to ask is if this maneuver is enough to suppress the spurious emissions caused by the handsets to nearby bands. Further details after initial deployment will shed light on the mysterious case of band 13. Bankruptcy courts in Canada and the United States unanimously approved Nortel Networks Corp.'s request to sell its main wireless business to Swedish rival LM Ericsson. The US$1.13-billion sale will deliver to the Swedish telecom firm Toronto-based Nortel's CDMA, or code division multiple-access technology, an older system, but one still widely deployed by mobile-phone carriers. CDMA is expected to continue to be in use in developing markets like Asia for the next several years. However, the most lucrative portion of the sale, analysts say, comes in Nortel's long-term-evolution technology, or LTE. Nortel said it has spent as much as US$200-million annually developing the next-generation wireless gear that is expected to become the global standard in the future. "Nortel still owns all of the LTE patents," Nortel counsel Derrick Tay said in court. Mr. Tay said Nortel owned some 5,500 patents. Of those, 600 were being "transferred" to Ericsson while none of the LTE intellectual property was being sold. Instead, Nortel will be licensing them to Ericsson, he said. I am curious as to what does it mean by licensing the LTE patents considering the fact that Nortel is bankrupt. If the license period is something like say 99 years then it shouldnt really matter for Ericsson. I am not sure just making a guess. Ericsson and Nokia, once the staunchest opponents of CDMA technology, found themselves in a bidding war for bankrupt Nortel's CDMA assets. The war ended on Friday with Ericsson on top and willing to pay $1.13 billion for most of Nortel's CDMA and LTE assets. Ericsson had tried to make a go of it in the North American CDMA market following its purchase of Qualcomm's infrastructure business that was part of its IPR settlement with Qualcomm in 1999. It subsequently ended the business after failing to penetrate this market since Qualcomm didn't have much of an installed base. Nokia, now Nokia Siemens Networks, never tried to play in the North American CDMA market, and thus has a weak North American market share overall at around 5.5 percent. However, Ericsson this year has made significant headway into the U.S. market, scoring a big LTE deal with Verizon--at the expense of Nortel--and winning a $5 billion CDMA outsourcing agreement with Sprint Nextel. Did it really need to spend $1.13 billion to gain more market share? The answer is yes. Despite winning these two U.S. deals, the biggest criticism of Ericsson has been its lack of CDMA expertise--whether managing a network or migrating CDMA operators to LTE. Now it has both. Given the fact that Nortel's CDMA gear is in a significant portion of CDMA networks operating around the world, Ericsson now has a great story to tell. It needs that CDMA expertise to migrate customers from CDMA to LTE--especially since voice traffic will continue to run over CDMA networks while data gets routed over LTE for the foreseeable future. For Ericsson, it's no longer about getting a foot in the door. It's about crushing the competition. Ericsson is looking forward to a future when both WCDMA and CDMA operators look to it to help them migrate to LTE. But as Ericsson CEO Carl-Henric Svanberg said on the conference call this morning, "CDMA will be the first markets to migrate to LTE so therefore it is important to us." Meanwhile, a deal like this could be the nail in the coffin for some vendors. It's certainly not good news for NSN, which would have boosted its North American market share to 30 percent had it won the assets. And Chinese vendors ZTE and Huawei have been trying hard to make inroads into the North American market through CDMA. This deal certainly hampers those efforts. And Alcatel-Lucent just saw its major competitor become significantly stronger. Alcatel-Lucent was the vendor with the better CDMA-to-LTE conversion story while Nortel was stuck in bankruptcy limbo. Of course, it's not just about getting a stronger foothold in LTE. Nortel's CDMA business is a money-maker, and Ericsson executives on the call this morning said they believe the unit will continue to be profitable for the next few years as operators keep investing in their CDMA networks. There are actually operators looking to deploy CDMA EV-DO Rev. B. And don't forget the services market, a major growth engine for Ericsson. Ericsson said the deal will be earnings per share accretive within the first year. Nokia, the world's largest maker of mobile phones, reported Thursday that its second-quarter operating profit fell 71 percent to 427 million euros ($600 million) from 1.47 billion euros during the same quarter a year earlier. The company also reported that sales fell about 25 percent to 9.9 billion euros in the second quarter. But sales were up 7 percent sequentially from the first quarter of 2008. 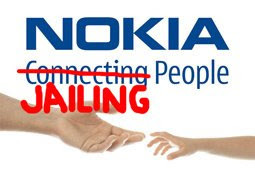 Nokia shipped 103.2 million units during the quarter, which was down about 15 percent compared with a year earlier. But shipments were up 11 percent sequentially compared with the first quarter of this year. Nokia said that it increased its market share sequentially for global sales of mobile phones to an estimated 38 percent. And its smartphone market share grew sequentially to 41 percent. Toward the end of the second quarter, Nokia brought its N97 smartphone to the U.S. market. It was bound to happen, but we didn’t think the Nokia N97 would outsell the Nokia 5800 quite as quickly as it has. However, from sales figures that have just been released, it looks like the big fight of the summer is going to be between Nokia’s two touchscreen smartphones. South Korean company Samsung Electronics Co., Ltd recently announced the earnings results for the second quarter of the ongoing year. Globally, the company registered an 11.7 percent increase in revenues during the quarter on a yearly basis, reaching 32.51 trillion Korean won, and posted 2.52 trillion won operating profit, up 436 percent compared to the previous quarter of the year. Samsung’s Telecommunications business also went up compared to the same time frame last year, reaching 10.04 trillion won in revenue, or a 27.4 percent increase, while the operating profit was of 1.00 trillion won, with a 10 percent margin. During the three-month period, the company says, its mobile phones sales reached 52.3 million units, marking a 14 percent increase compared to the previous quarter. LG Electronics posted a record quarterly profit on strong mobile phone and TV sales, helping it win market share from rivals Nokia and Motorola today. However concerns over weaker margins may stall a rally in its shares. LG, which trails Nokia and Samsung in mobile phones, sold a record 29.8 million handsets in the second quarter, up from 22.6 million units in January to March. It posted an 11 per cent operating profit margin in handsets, compared with 6.7 per cent in the first quarter, a figure Choi said was "pretty remarkable." The company's operating profit margin was 7.8 per cent in the second quarter and was at 4.3 per cent for all of 2008. Fourth ranked Motorola is working to narrow losses through cost cuts in the face of sharp drops in sales, while world fifth maker Sony Ericsson is also braced for a tough second half of 2009 as a demand slump hits its stronghold mid-range products focused on camera and music features. Apple's quarterly results were better than forecast, thanks to strong iPhone sales, including its new 3GS model. Net profits hit $1.23bn (£953m), or $1.35 a share, in the fiscal third quarter to 27 June, from $1.07bn, or $1.19 a share, a year earlier. The US technology giant sold more than 5.2 million iPhones in the quarter, seven times more than a year earlier. Apple chief financial officer Peter Oppenheimer said: "We are very proud of this result, particularly given the economic climate around us." He also admitted that Apple was "currently unable to make enough iPhone 3GS to meet high demand and we are working to improve that". Apple also hopes to make the iPhone available in more countries than the current 18, including China "within a year". Another interesting peice of information from the 3G Americas whitepaper I mentioned earlier. 3GPP RAN WG4 has begun investigating possible UE RF architectures to enable four LTE-Advanced resource aggregation scenarios for ITU-R submission purposes. Initial analysis has focused on UE complexity and power consumption for the resource aggregation scenarios. 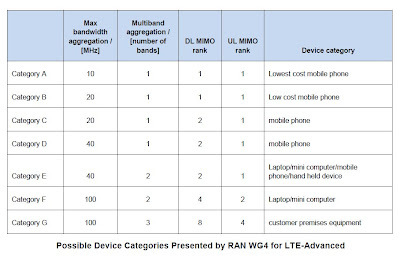 RAN WG4 has initially concluded that it would be beneficial for LTE-A feasibility study purposes to consider various device categories in order to enable a sufficient number of different UE categories in LTE-Advanced. One set of device categories presented by RAN WG4 is listed in the figure below. RAN WG 4 noted in particular that it envisions the need for an absolutely lowest cost terminal. This is reflected in Category A above, which represents even a simpler UE category than 3GPP Release 8 currently allows. Last weekend, I saw this phone in someone's hand. I wasnt able to ask about this phone but I was sure of being able to dig this out. 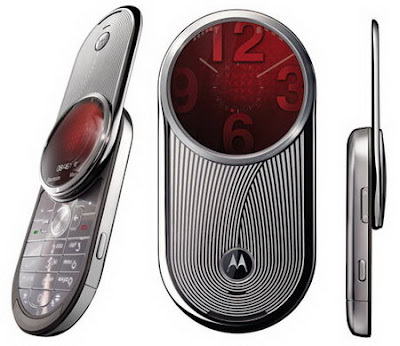 Motorola AURA luxury phone. Inspired by luxury watches and handcrafted design, Motorola AURA is a unique handset that breaks convention and re-establishes artistry in mobile device design and manufacturing. Combining superb craftsmanship and a distinctive interface, AURA delivers a sensory experience that is second to none for those with refined tastes. From the moment AURA owners pick up their devices, they elevate their own experience in luxury and unmatched quality. Motorola AURA luxury phone comes with a quad-band GSM/GPRS/EDGE (850/900/1800/1900 MHz), a 2 megapixel camera, stereo Bluetooth support, web browser, CrystalTalk Technology, 2GB of internal memory, media player. Unfortunately it lacks 3G connectivity. Motorola AURA costs $2,000. More information is available from Motorola’s website here. 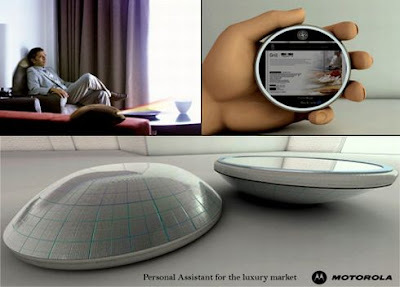 Motorola is out with another conceptual device called the Digital Butler, a personal assistant device for the luxury market. This highly mobile device will work on advance 4G networks with GPS, giving you a full-time network connection to VIP services. The device will also include a circular touch-screen interface, accelerometer technology, PDA phone, squeeze buttons on the perimeter, and full-resolution built-in multimedia LED projector. Let’s just hope it will come into production soon. More Info at Yanko Design. Android fever seems to be catching on. Everyone phone manufacturer now wants to show that they are active in Android market. Few weeks back there were also rumours of Nokia launching android device (which may still be true). HTC is at the moment the leader, releasing more Android phones than anyone else. With four billion handsets in the world – more than twice the number of internet users, and two and half a billion more than the number of televisions – it's safe to describe the mobile phone as the most successful technology of our generation. But what's the next step for mobile communication? If Google has its way, the future is Android – and the next few months are going to be crucial to its success. Android, in case the news has passed you by, is billed as the mobile phone operating system that will change the way we use mobiles. Where traditionally, phones have all worked differently, with usability ranging from the passable to the infuriating, Android's mission is to simplify, partially by devising a more intuitive interface, and also by making it so widely available that it becomes a standard. "Combining the simplicity of Android software with its imminent availability on a range of mass-market phones from various manufacturers, and the trend in developing countries to go 'straight to mobile', makes Android an exciting global platform for the next few years," says Richard Warmsley, head of internet and entertainment of T-Mobile. From Android's humble beginnings as a two-person company in Palo Alto, California, through being bought up by Google in 2005, it has grown into the flagship operation of a group of 48 companies known as the Open Handset Alliance. Featuring such heavyweights of the tech world as LG, Toshiba and Samsung, its aim is to "enrich the lives of countless people across the globe" by improving mobile experiences. The handset manufacturer Motorola is so confident the future is Android it's reportedly retired its team of 77 engineers who were working on the company's own operating system, and is now hiring software engineers familiar with Google's free alternative. Such is its potential that Android has been mooted as the software of the future for netbooks and set-top boxes as well as phones. With any discussion of mobile phones, the elephant in the room is always going to be Apple's iPhone, which has been a huge critical and commercial success. Android phones and the iPhone might appear to be in direct competition; they are both high-spec, and similarly priced. But Al Sutton, a UK-based Android developer, thinks the situation may develop along similar lines to the home computing market: "I can see the iPhone and Android co-existing in the future in a similar way that Macs and Windows PCs do at the moment", he says. "Apple is focused on being a premium brand, whereas Android's focus is ubiquity." Although Android phones are only rarely to be spotted in the wild in Britain right now, the groundswell of support for the system from manufacturers may well see a number of devices launched at once in the coming year. "We are not facing a shortage of offers powered by Android," claims Peter Becker-Pennrich, director of terminals marketing for Vodafone, on the brand's future product line-up. T-Mobile is similarly enamoured: "The open nature of Android, the innovation and choice it bring, mean that it will establish itself as one of the most important mobile platforms of the next few years", agrees Richard Warmsley. Next month will see the release of the G2 Touch from T-Mobile and the Hero from Orange, both versions of a new touchscreen handset from HTC, which features a hefty five-megapixel camera with video functionality, GPS and, of course, full integration with Google products like Gmail, Google Talk and YouTube. The Digital Dividend refers to the reallocation of significant amounts of spectrum as a result of the switchover from analog to digital TV, a phenomenon occurring across the globe. Historically, analog TV operates in the UHF band between 470-862 MHz. The analog to digital switchover will free a substantial amount of spectrum for new services, including digital television and mobile broadband. 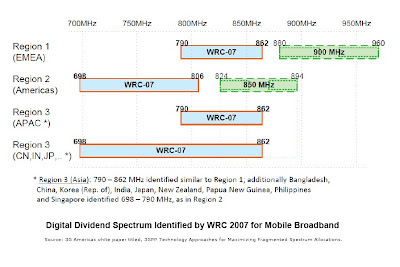 Mobile services will need at least 100 MHz of this spectrum for mobile broadband. The results of WRC 07 incorporate this vision, as well as the need to promote harmonization of these bands, as reflected in the following above. As is planned, there is no one globally harmonized Digital Dividend spectrum band. Further, the APAC countries have the flexibility to adopt the Region 1 or Region 2 plans. The important task of promoting harmonization and aligning band plans as far as possible with WRC-07 agreement, in order to realize the benefits of harmonization for their citizens, now falls to policymakers to accomplish. In fact, the EC recently launched a consultation on Digital Dividend spectrum. Noting that importance of taking prompt action “to prevent the emergence of fragmented national legacy situations” that would stymie the development of future equipment and services in the 800 MHz band, the consultation proposes that the EC undertake two urgent actions by autumn of 2009: (1) Member States that have not completed the digital switchover would be requested to confirm switch off of analogue TV under national law by 1 January 2012; and (2) the EC would draft a Commission decision, for regulatory opinion in the autumn of 2009 and formal adoption at the beginning of 2010, on technical harmonization measures for transitioning the 790-862 MHz band to non-broadcast uses. Credit to 3G Americas for publishing these interesting white papers. 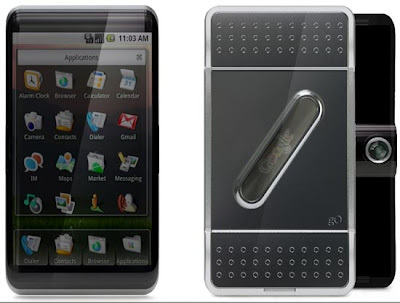 Designed by Taiwan's Tryi Yeh the Google-G0 is both a touchscreen phone and a slider, with four big navigation buttons for quick access to email, web browsing and more, which change depending on what you're doing. We don't see any physical keyboard anywhere, so it's probably handled virtually. On the back there's a set of speakers and a camera. It looks like the G0's functionality persists when you plug it into its charger, and there's an image of a dock that looks like it'd either let you watch TV on your phone, or use your G0 like a remote. 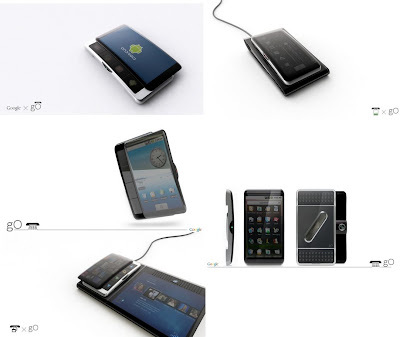 Check out the gallery below for more of Yeh's Google-G0 concept touchscreen phone. 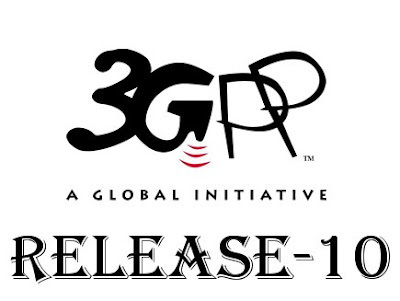 Self-Organising Networks popularly known as SON are feature of 3GPP Release 8 and Release 9. SON has been around for quite some time now and is not a new concept. Its not an evolutionary technology, rather a revolutionary technology. The first time I heard of SON was in relation to Femtocells. Remember, a Femtocell has to start in an unfamiliar environment, learn about its surrounding and then adapt to the environment. Other terms often used to mean SON is 'Plug-n-play' or 'PnP', 'Zero Touch', 'Auto Configured', 'Self Managed...', etc. SON is a very useful feature that will allow for the automation of several tasks lowering the OPEX costs. Examples include plug and play or a cell in between existing ones, neighbour recognition and (re-)configuration, optimizations, etc. Properly implemented, it could kill off drive-testing. In simplest of terms, SON can be explained with the basic diagram above. A new cell created in an existing environment possibly due to too many existing resources being in use or too many users in an area during a particular time (football match for example) and this cell has to look at the surrounding and adjust its conditions. The other existing cells also have to adjust tehmselves with the change in surroundings. According to recent analysis in NEC Whitepaper on SON (available here), about 17 % of wireless operator’s CAPEX is spent on engineering and installation services. SON’s self-configuring functions are expected to eliminate many on-site operations for the basic settings and subsequent updating of network equipments, and thus reduce CAPEX. It is also known that about 24 % of a typical wireless operator’s revenue goes to network OPEX, which are the cost of network operation and maintenance, training and support, power, transmission, and site rental. SON’s self-optimizing functions will reduce a workload for site survey and analysis of network performances, and thus reduce OPEX. Moreover, SON’s energy-saving functions reduce the costs of power consumed by the equipment. Self-optimizing and self-healing architectures improve user perceived qualities by mitigating quality degradations that result from inaccuracies of the planning or equipment faults as early as possible and by optimizing the network parameters under interference and overload conditions. 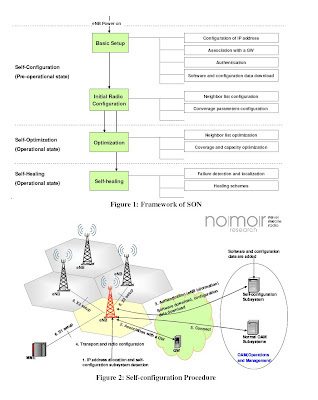 Nomor research has got an excellent paper on SON with regards to LTE. The full paper is available here. Here is an extract from that paper. 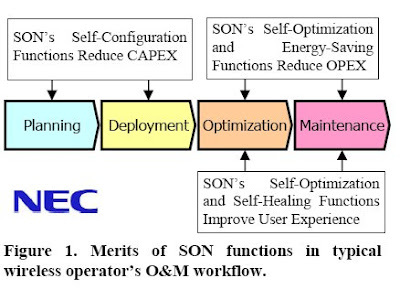 The main functionality of SON includes: self-configuration, self-optimization and self-healing. 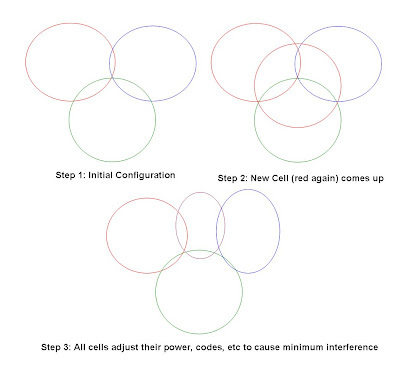 Self-healing function aims at automatic detection and localization of most of the failures and applies self-healing mechanisms to solve several failure classes, such as reducing the output power in case of temperature failure or automatic fallback to previous software version. A Self-configuration Subsystem will be created in OAM to be responsible for the selfconfiguration of eNB. For self-optimisation functions, they can be located in OAM or eNB or both of them. So according to the location of optimisation algorithms, SON can be divided into three classes: Centralised SON, Distributed SON and Hybrid SON. The paper also lists the Use cases and the problems ands solutions for the use cases. 3GPP has introduced SON items in its standardization path as required features for LTE deployments. Rel. 8 includes the first specifications on requirements, integration with operators’ processes, and identification of main use cases. Rel. 9 is expected to define advanced features, which will introduce self-healing and self-optimization capabilities into LTE. The SON related specifications are driven from the SA5 Working Group (WG) – mainly for architectural aspects– and the RAN3 WG – especially for the optimization of radio functions. Also, Rel. 8 defined the grounding documents for SON: “SON Concepts and Requirements” in TS 32.500, and two main use cases– “Self-Establishment of eNodeB” and “Automatic Neighbor Relation” – in TS 32.501, 32.502 and 32.511. The most inefficient mobile data applications are mobile email, location based services, secure applications and things like stock updates and tickers. This is what Alcatel-Lucent’s Mike Schabel, Phd, Alcatel-Lucent General Manager, 9900 Wireless Network Guardian, told journalists in an excellent presentation on the difficulties the huge increases in wireless data usage will give mobile operators. Schabel said that although attention has been focused on P2P traffic because of the volume involved, such services are in fact very efficient in terms of the network resources they use. In essence, a user downloading a film, or watching a video, gets online, establishes a radio connection, does what they have to, and then gets offline. This kind of behaviour is predictable and manageable, Schabel said. In contrast, Schabel’s team found that in one operator, mobile email was using 25% of the available signaling capacity, even though it was only responsible for 4% of the network traffic volume. This is because of the constantly on-off nature of a push mobile email device as it receives messages, continuously signing on and off the network. Location based services, that also required a constant “conversation” with the network, are also very resource intensive. Schabel said that examples such as this show that there is a “hidden cost” in many of the data services that mobile operators are looking to deploy. Operators need to factor in cost per minute and cost per bit, he said. A further cost comes when as a result of not understanding network activity such as this, or the way an application works imperfectly on a device, can cause outages and delays in the network – causing poor user experience. The answer, he said, is first to understand the root cause of problems occurring within the network, or on other elements upon which the service relies (content/ app server, handset, web server, etc). Second, operators then can plan and design their networks to meet predictable and known demand (“System engineering 1.0”, in Schabel’s words). This may include additional bearers and resources, but it may also be something as simple as re-aligning existing resources. Only then would operators need to consider other throttling or management methods such as policy management, or CRM and billing tools. 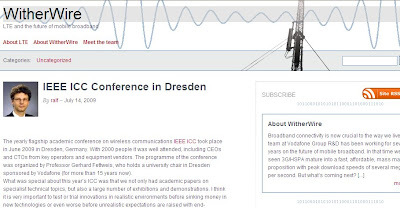 Schabel was speaking to publicise his company’s tool, the 9900 Wireless Network Guardian. This is a device that takes in core network data information in real time, analyses it, and produces data on specific issues of network performance. Schabel said that the issue to date is that wireless network monitoring tools have been “blind” to IP traffic, while packet inspection and other IP techniques cannot “see” the wireless network. What is needed is a system that marries to two together, so operators can see services operating both in cost per bit, and cost per minute terms. 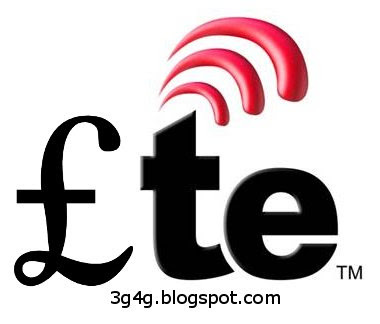 A report last year mentioned that the number of LTE subscribers by 2013 will be 85 million but a new report from research firm Forward Concepts, which looks at trends including 3G evolution and handset shipment growth, claims that the number of LTE users will be 56 million by 2013. According to the report, HSPA+ will begin to displace W-CDMA and HSDPA technologies, and the first LTE devices to hit the market in 2010 will be data cards and dongles. The Forward Concepts study also takes a look at some other trends in the industry. The firm predicts that global handset shipments will be down this year, and forecasts a 4.4 percent contraction. The report predicts a resurgence in unit shipments in 2010, however, and calls for a 12.8 percent growth in shipments. 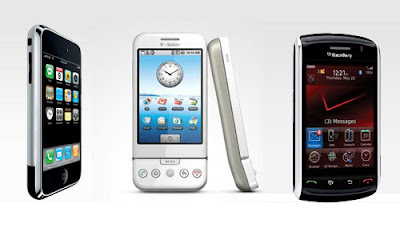 The one bright spot for 2009 is smartphones: Forward Concepts predicts a 25 percent jump in smartphone sales. LCD display technology also will come under pressure from other technologies, including OLED, ePaper, Qualcomm's Mirasol and Liquavista, according to the report. The market for these "post-LCD" displays will grow to over $3 billion in 2013, the report said. On the operator front, NTT DoCoMo is sticking to its plan to be a first stage deployer, with first roll-out in 2010, while work has begun on outdoor testing of the TD-LTE technology that all three Chinese carriers will use. DoCoMo chief Ryuji Yamada told the London Financial Times that the cellco has not gone cool on its 2010 timescale. The firm needs to enable new services to respond to UQ's aggressive launch of mobile broadband offerings based on WiMAX, and to stay ahead of established rivals KDDI and Softbank, and the disruptive and data-driven newcomer eMobile. Yamada said DoCoMo wants to be "in the leading group in this technology", and that he sees a move to LTE as a way to be fully compatible with global standards, which will improve device economics. In 3G, DoCoMo moved so early that it deployed a pre-standard implementation of W-CDMA, FOMA. This is now used by 91% of its base, with over 50m subscribers after almost eight years in commercial service, but it has two downsides that will drive DoCoMo to LTE early - over-dependence on Japanese handset makers, with the high costs of slightly off-standard devices; and networks that are older than those of newer cellcos and in areas are becoming obsolete. The Chinese operators have similar dilemmas, especially China Mobile, which is stuck with an off-standard 3G technology, TD-SCDMA, and wants to move quickly to a platform that brings global economies of scale and allows it to be more cutting edge in services. While it may have virtually no opportunity to get ROI on its 3G spend, it aims also to be in the first group of LTE deployers, though it will be using the TDD strain of the standard. Earlier this year, it took over the trial sites in Spain that had previously been used by Vodafone and Verizon Wireless for FDD-LTE, and is now reported to be moving this initial test program to China and towards more real world outdoor trials. Sources say these outdoor tests could also involve other Chinese operators, and will involve six vendors working in the Beijing area. Surprisingly, if the insiders are right, these vendors do not include Motorola, which has been the main supplier in the Spanish project, and claims it has a major headstart in TD-LTE because of its extensive experience with TDD mobile broadband, using WiMAX. But the new Chinese tests involve four homegrown vendors (Huawei, ZTE, Datang and Potevio, the latter a Nokia venture) plus Ericsson and Nokia Siemens. The inclusion of more CDMA-oriented suppliers, notably Motorola and Alcatel-Lucent, is likely to follow when CDMA carrier China Telecom starts its own TD-LTE tests. The testing process determined by the TD-LTE Working Group has three stages - indoor, outdoor and large-scale outdoor testing, the last of these involving two or three major cities with at least 100 base stations each. The local vendors have already been working on indoor testing in China since the start of the year. Via: LTE Watch, Rethink Wireless and Fierce Wireless. At first glance, Japanese cellphones are a gadget lover’s dream: ready for Internet and e-mail, they double as credit cards, boarding passes and even body-fat calculators. But it is hard to find anyone in Chicago or London using a Japanese phone like a Panasonic, a Sharp or an NEC. Despite years of dabbling in overseas markets, Japan’s handset makers have little presence beyond the country’s shores. “Japan is years ahead in any innovation. But it hasn’t been able to get business out of it,” said Gerhard Fasol, president of the Tokyo-based IT consulting firm, Eurotechnology Japan. The Japanese have a name for their problem: Galápagos syndrome. Japan’s cellphones are like the endemic species that Darwin encountered on the Galápagos Islands — fantastically evolved and divergent from their mainland cousins — explains Takeshi Natsuno, who teaches at Tokyo’s Keio University. This year, Mr. Natsuno, who developed a popular wireless Internet service called i-Mode, assembled some of the best minds in the field to debate how Japanese cellphones can go global. 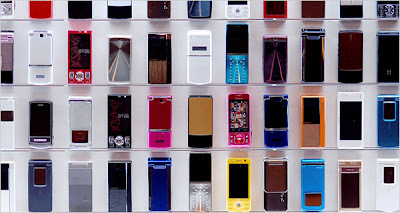 The only Japanese handset maker with any meaningful global share is Sony Ericsson, and that company is a London-based joint venture between a Japanese electronics maker and a Swedish telecommunications firm. And Sony Ericsson has been hit by big losses. Its market share was just 6.3 percent in the first quarter of 2009, behind Nokia of Finland, Samsung Electronics and LG of South Korea, and Motorola of Illinois. Yet Japan’s lack of global clout is all the more surprising because its cellphones set the pace in almost every industry innovation: e-mail capabilities in 1999, camera phones in 2000, third-generation networks in 2001, full music downloads in 2002, electronic payments in 2004 and digital TV in 2005. Japan has 100 million users of advanced third-generation smartphones, twice the number used in the United States, a much larger market. Many Japanese rely on their phones, not a PC, for Internet access. Several Japanese companies are now considering a push into overseas markets, including NEC, which pulled the plug on its money-losing international cellphone efforts in 2006. Panasonic, Sharp, Toshiba and Fujitsu are said to be planning similar moves. “Japanese cellphone makers need to either look overseas, or exit the business,” said Kenshi Tazaki, a managing vice president at the consulting firm Gartner Japan. At a recent meeting of Mr. Natsuno’s group, 20 men and one woman crowded around a big conference table in a skyscraper in central Tokyo, examining market data, delivering diatribes and frequently shaking their heads. The discussion then turned to the cellphones themselves. Despite their advanced hardware, handsets here often have primitive, clunky interfaces, some participants said. Most handsets have no way to easily synchronize data with PCs as the iPhone and other smartphones do. Then there are the peculiarities of the Japanese market, like the almost universal clamshell design, which is not as popular overseas. 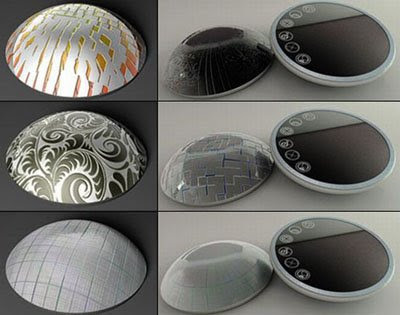 Recent hardware innovations, like solar-powered batteries or waterproofing, have been incremental rather than groundbreaking. The emphasis on hardware makes even the newest phones here surprisingly bulky. Some analysts say cellphone carriers stifle innovation by demanding so many peripheral hardware functions for phones. 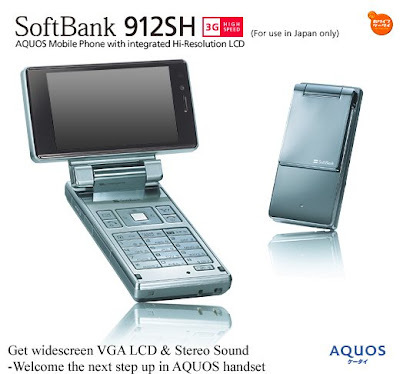 The Sharp 912SH for Softbank, for example, comes with an LCD screen that swivels 90 degrees, GPS tracking, a bar-code reader, digital TV, credit card functions, video conferencing and a camera and is unlocked by face recognition. Follow discussion on this article at Forum Oxford here. I spent a lot of time working on MBMS but operators decided not to roll out the technology. It was killed in its infancy. Earlier I blogged that MBMS wont be present in Release 8 but now there is interest in some quarters about MBMS being present in Release 9. As I have mentioned earlier, the main advantage of MBMS over other TV technologies is that no additional infrastructure is required, the same technology and spectrum is used as for the 3G/LTE case and user interaction is possible thereby involving participation. At the moment, I was only able to see eMBMS information in 3GPP TS 36.300 but I am sure more is on way soon. Section 15 of 36.300 is dedicated to eMBMS information. In E-UTRAN, MBMS can be provided with single frequency network mode of operation (MBSFN) only on a frequency layer shared with non-MBMS services (set of cells supporting both unicast and MBMS transmissions i.e. set of "Unicast/MBMS mixed cells"). MBMS reception is possible for UEs in RRC_CONNECTED or RRC_IDLE states. Whenever receiving MBMS services, a user shall be notified of an incoming call, and originating calls shall be possible. ROHC is not supported for MBMS. So where does it fit in the overall architecture? 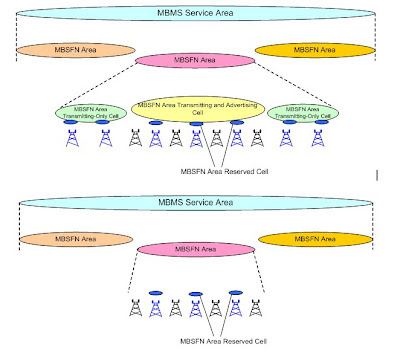 Multi-cell/multicast Coordination Entity (MCE): The MCE is a logical entity – this does not preclude the possibility that it may be part of another network element – whose functions are the allocation of the radio resources used by all eNBs in the MBSFN area for multi-cell MBMS transmissions using MBSFN operation. Besides allocation of the time/ frequency radio resources this also includes deciding the further details of the radio configuration e.g. the modulation and coding scheme. The MCE is involved in MBMS Session Control Signalling. The MCE does not perform UE - MCE signalling. When the MCE is part of another network element, an eNB is served by a single MCE. 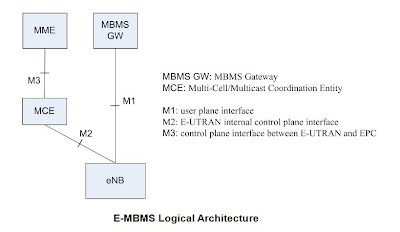 E-MBMS Gateway (MBMS GW): The MBMS GW is a logical entity – this does not preclude the possibility that it may be part of another network element – that is present between the BMSC and eNBs whose principal functions is the sending/broadcasting of MBMS packets to each eNB transmitting the service. 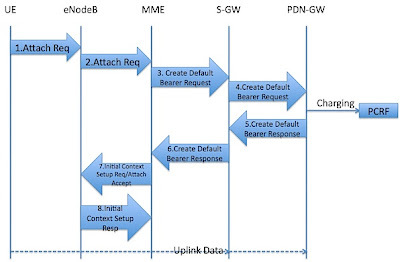 The MBMS GW uses IP Multicast as the means of forwarding MBMS user data to the eNB. The MBMS GW performs MBMS Session Control Signalling (Session start/stop) towards the E-UTRAN via MME. “M3” Interface: MCE – MME: An Application Part is defined for this interface between MME and MCE. This application part allows for MBMS Session Control Signalling on E-RAB level (i.e. does not convey radio configuration data). The procedures comprise e.g. MBMS Session Start and Stop. SCTP is used as signalling transport i.e. Point-to-Point signalling is applied. “M2” Interface: MCE – eNB: An Application Part is defined for this interface, which conveys at least radio configuration data for the multi-cell transmission mode eNBs and Session Control Signalling. SCTP is used as signalling transport i.e. Point-to-Point signalling is applied. “M1” Interface: MBMS GW – eNB: This interface is a pure user plane interface. Consequently no Control Plane Application Part is defined for this interface. IP Multicast is used for point-to-multipoint delivery of user packets. It is not precluded that M3 interface can be terminated in eNBs. In this case MCE is considered as being part of eNB. However, M2 should keep existing between the MCE and the corresponding eNBs. This is depicted in Figure above which depicts two envisaged deployment alternatives. In the scenario depicted on the left MCE is deployed in a separate node. In the scenario on the right MCE is part of the eNBs. It will be possible to have an MBMS Dedicated cell or a MBMS/Unicast mixed cell. For transmission, it will be possible to have a Single-cell transmission or Multi-cell transmission. Multi-cell transmission where the safe information is sent synchronously over multiple cells will have an advantage of receivers being able to combine information from Multiple cells and also to roam in the area of transmission seamlessly. More information when detailed specs are available. Missed this one earlier but otherwise I am a big Dilbert fan. Thought it would be nice to end the week with. By the way, last year I blogged about the Mobile Billing strategies which may be useful for you if you are considering getting new contract. Last year there was a talk here in UK about adding padding to the lamp-posts because people were bumping into them while texting. The survey of over 1,000 Britons suggested that one in 10 had suffered an injury from a collision while sending an SMS. The research claimed that there were 68,000 SMS-related injuries in the UK last year, ranging from minor bumps to skull fractures. Now, I read this news about Alexa Longueira, 15, whose family is suing after the teenager fell into an open manhole in Staten Island, New York, while trying to send a text message. Poor Alexa apparently suffered a fright and some scrapes on her arms and back when she fell. Her mother, Kim Longueira, said it did not matter that her daughter was texting when she fell down the hole. "Oh my God, it was putrid," she told MNBC. "One of her sneakers is still down there." If the case comes to court it is destined to join such infamous lawsuits as the woman who sued McDonald's after spilling hot coffee on herself, which inspired an annual award for the most ridiculous lawsuit. A glance at British legal history suggests Longueira may have actually have a chance of winning. In the 1964 case of Haley v London Electricity Board it was deemed workmen should have known a hole might pose a threat to visually impaired people. Whether texting and walking is now so common that a court ruling will require workmen – and the rest of us – to adjust our actions accordingly remains to be seen. The mobile phone company Nokia is being hit by a growing economic boycott in Iran as consumers sympathetic to the post-election protest movement begin targeting a string of companies deemed to be collaborating with the regime. Wholesale vendors in the capital report that demand for Nokia handsets has fallen by as much as half in the wake of calls to boycott Nokia Siemens Networks (NSN) for selling communications monitoring systems to Iran. There are signs that the boycott is spreading: consumers are shunning SMS messaging in protest at the perceived complicity with the regime by the state telecoms company, TCI. Iran's state-run broadcaster has been hit by a collapse in advertising as companies fear being blacklisted in a Facebook petition. There is also anecdotal evidence that people are moving money out of state banks and into private banks. 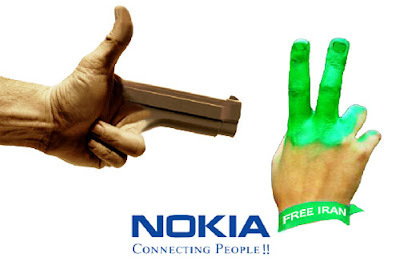 Nokia is the most prominent western company to suffer from its dealings with the Iranian authorities. Its NSN joint venture with Siemens provided Iran with a monitoring system as it expanded a mobile network last year. NSN says the technology is standard issue to dozens of countries, but protesters believe the company could have provided the network without the monitoring function. Siemens is also accused of providing Iran with an internet filtering system called Webwasher. "Iranians' first choice has been Nokia cellphones for several years, partly because Nokia has installed the facility in the country. But in the past weeks, customers' priority has changed," said Reza, a mobile phone seller in Tehran's Big Bazaar. "Since the news spread that NSN had sold electronic surveillance systems to the Iranian government, people have decided to buy other company's products although they know that Nokia cellphones function better with network coverage in Iran." Some Tehran shops have removed Nokia phones from their window displays. Hashem, another mobile phone vendor, said: "I don't like to lose my customers and now people don't feel happy seeing Nokia's products. We even had customers who wanted to refund their new Nokia cellphones or change them with just another cellphone from any other companies. "It's not just a limited case to my shop – I'm also a wholesaler to small shops in provincial markets, and I can say that there is half the demand for Nokia's product these days in comparison with just one month ago, and it's really unprecedented. People feel ashamed of having Nokia cellphones," he added. News of the boycott has appeared on the front page of Iranian pro-reform papers such as Etemad-e Melli, owned by the reformist candidate Mehdi Karroubi. Hadi Heidari, a prominent Iranian cartoonist, has published an image of a Nokia phone on a No Entry traffic sign. A Nokia spokeswoman refused to comment on the company's sales in Iran. The Iranian authorities are believed to have used Nokia's mobile phone monitoring system to target dissidents. Released prisoners have revealed that the authorities were keeping them in custody on the basis of their SMS and phone calls archive, which was at officials' disposal. One Iranian journalist who has just been released from detention said: "I always had this impression that monitoring calls is just a rumour for threatening us from continuing our job properly, but the nightmare became real when they had my phone calls – conversations in my case. "And the most unbelievable thing for me is that Nokia sold this system to our government. 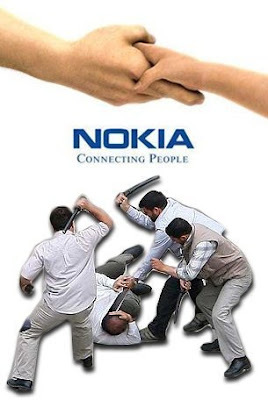 It would be a reasonable excuse for Nokia if they had sold the monitoring technology to a democratic country for controlling child abuse or other uses, but selling it to the Iranian government with a very clear background of human rights violence and suppression of dissent, it's just inexcusable for me. I'd like to tell Nokia that I'm tortured because they had sold this damn technology to our government." 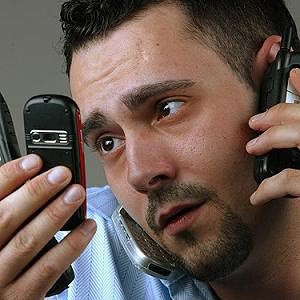 NSN spokesman Ben Roome said: "As in every other country, telecoms networks in Iran require the capability to lawfully intercept voice calls. In the last two years, the number of mobile subscribers in Iran has grown from 12 million to over 53 million, so to expand the network in the second half of 2008 we were required to provide the facility to intercept voice calls on this network." The SMS boycott, meanwhile, has apparently forced TCI into drastic price hikes. The cost of an SMS has doubled in recent days. Protesters view the move as a victory. Yesterday I blogged about the Airvana HubBub demo, so someone pointed out to me the IP access demo of Virtual Fridge notes. I saw the demo in Femtocells World Summit and wasnt clear on how exactly it worked, but this Youtube video shows it quite well. Its good to see R&D people from Vodafone starting their own blog. Vodafone has been very active with R&D and they also do very interesting lectures. I covered about one such lecture in Telecoms area here. Few months back I also attended an interesting lecture on Mobile Healthcare about which I blogged here. I am sure this is going to be an interesting blog with lots of useful information and insights. 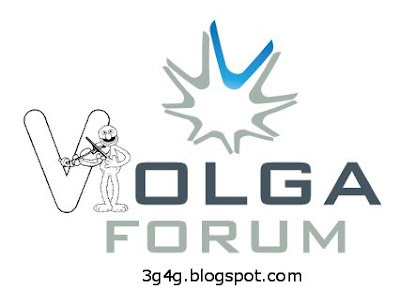 Regular readers of this blog probably remember that I'm a fan of Voice over LTE via GAN (VOLGA). For those who don't, have a look here on more details on why I think it has a good chance of becoming THE voice solution for LTE. It's amazing how fast the Volga-Forum is pushing out the specifications. In May, they published the stage 1 specification document, which contains a high level architecture and the requirements. Now only a month later, a first version of the stage 2 specification is available. Stage 2 specifications as per 3GPP contain a detailed architecture description and all procedures required from connecting to the network, originating and terminating calls, doing handovers, etc. While their speed is incredible, maybe it should not be that surprising, because VOLGA is based on the already existing 3GPP GAN (Generic Access Network, i.e. GSM over Wi-Fi) specification. That's a good thing because that means that VOLGA could thus be developed quite quickly as it's likely that existing products can be modified instead of being designed from scratch. In addition, this should also mean that the first version of the standard is already quite mature as many areas were already verified during implementation and rollout of GAN in current networks. I did a quick comparison between the two stage 2 specs and as I expected, many parts are very similar. While the GAN stage 2 specification has 126 pages, the current VOLGA stage 2 specification has 87 pages. This is probably because VOLGA is simpler than GAN. There are fewer handover procedures and most of the handover details are part of the 3GPP Single Radio Voice Call Continuity (SR-VCC) specification (for IMS) so they don't have to be included in the VOLGA spec. In addition to fewer handover scenarios, handovers are a bit more simple with LTE from a VOLGA perspective, as the network takes care of it unlike with GAN, where the mobile has to force the network into a handover. Also, there's no need to support the packet switched part of the network which also significantly lowers the complexity. Well done, I am looking forward to the stage 3 specification which will contain the details on all messages and information elements used. I blogged about VoLGA last month here. The other day I heard from Alex GeunHo Lee about his new blog related to 4G technologies IPR. Alex has got extensive experience in IPR and patent related issues and I am sure his blog will be very useful for everyone. Couple of Alex's presentations are embedded below which I am sure many would find interesting. You know you're #mobsessed when you think text'n'drive is for amateurs. You google and drive. You are #mobsessed when you think in sentences of 140 characters or less. You know you're #mobsessed when you can't download new apps to your iPhone without deleting old ones. You know you are #mobsessed when dropping your phone causes a near death experience. And you can't help singing when the phone still works. Check the search results on Twitter. I have added initial signaling MSC for an LTE UE at the 3G4G website here. I havent yet managed to expand on the signalling details yet but it should be a good starting point for most people. Santosh on his Wired n Wireless site has details on LTE Attach procedure which you may find interesting here. See here. 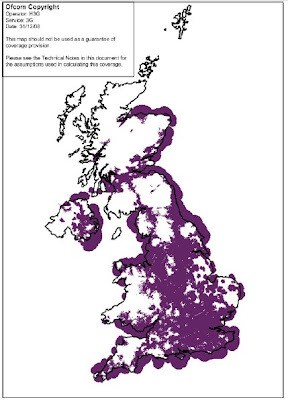 Ofcom has just released (or as The Register puts it; found under the sofa) 3G coverage maps for UK. Its useful for people who dont live in big towns but planning to take out contracts on dongles/data services. They can now quickly check which operator to go for. These 3G coverage maps by mobile operator were prepared in January 2009. They represent the area where we have assessed the mobile operators met a minimum coverage threshold set by Ofcom (see technical notes below). The shaded areas on the maps indicate areas where customers have the possibility of making and receiving a call outside over a 3G network (but with no guarantee of being able to do so). They do not indicate areas where customers are able to access higher data rate services. All operators produce their own coverage indicators on their websites which are likely to provide more reliable guidance to network availability in any given area. The accuracy and detail of the maps are not to the same level as the mobile operators publish. These maps show UK-wide general coverage and are not suitable for zooming in to see specific locations i.e. a particular house or street. 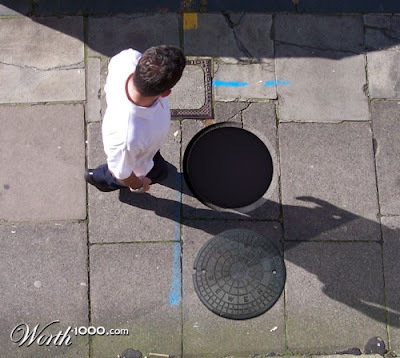 Also they are not suitable for assessing the quality or depth of coverage within the indicated areas (e.g. different operators may be able to offer better or worse data rate services or support a smaller or greater number of users). You can see the PDF of the coverage maps here. View more documents from ACMBangalore. Does number portability mean that data within an AuC is compromised? Not really. Number portability does not mean sensitive data from old AuC are transferred to the new AuC. The new operator will issue a new USIM which will have a new IMSI. Number portability only means that MSISDN is kept the same for others to call the mobile. The translation between MSISDN and IMSI is done at a national level register. Such a translation will identify the Home PLMN and the HLR that’s needs to be contacted for an incoming call. That’s the theory and that’s how it should be done. It will be interesting to know how operators in India do this. You can read all Q&A's here. I wrote a tutorial on UMTS security many years back. Its available here. In the past two years, M2M (machine-to-machine) applications have become one of the most talked-about topics in the wireless industry. While M2M apps can be used for many purposes (such as smart homes, smart metering/electricity meter reading, fleet management, mobile workforce, automobile insurance and vending machines) and in many sectors (such as healthcare, agriculture, commercial, industrial, retail and utility), smart metering applications--also known as smart grids--present the biggest growth potential in the M2M market today. With many leading wireless service providers and utility companies jumping on the bandwagon and the growing support from states like Texas and California, M2M applications are set to become very successful in the coming years. AT&T in March announced a new alternative for electric utility companies looking to provide the benefits of smart grid technology to the residential sector. 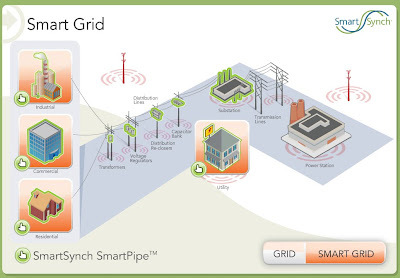 AT&T and SmartSynch are for the first time providing utilities with a cost-effective solution by combining a new suite of service plans from AT&T designed specifically for machine to machine (M2M) communications with SmartSynch's smart grid solutions already deployed at more than 100 utilities throughout North America. With this new solution from AT&T and SmartSynch, electric utility companies will now be able to concentrate on efficient electricity delivery rather than being distracted by building, maintaining, expanding and upgrading a communications network. This new solution offers a cost-effective point-to-point configuration model in which each meter communicates directly with the utility over the AT&T wireless network. Smart grids combine "smart meters", wireless technology, sensors and software so customers and utilities can closely monitor energy use and cut back when the availability of electricity is stretched to its limit. The IP-based smart grid model ultimately helps consumers understand the economics of their consumption patterns so they can make intelligent decisions about their power consumption. The smart grid technology will also help to enhance reliability and energy efficiency, lower power-line losses and provide utilities with the ability to remotely automate service, providing cost-savings for consumers. the ability to communicate directly with each meter. How can T-Mobile, the fourth-largest cell phone carrier in the U.S., generate business in the face of dropping net additional subscribers and competition from low-cost cell phone companies? Get into the smart grid. Like AT&T and Verizon, T-Mobile is hoping to leverage its already built-out wireless networks to tap into the coming smart grid boom spurred by the stimulus package. On Thursday, T-Mobile plans to announce that it’s developing a durable SIM card that can be embedded in smart meters (as well as used for other industrial processes), and a new partnership with smart meter technology maker Echelon. Mobile’s national director of Machine-to-Machine services, John Horn, told us that T-Mobile has been playing in the connected electric meter space for several years, including working with smart meter maker SmartSynch (AT&T has a deal with them, too), and he says the carrier has several utility pilot projects under way in the Pacific, Southwest and Midatlantic regions with an aggregate of “tens of millions” of smart meters. In some of those trials T-Mobile has been testing out its new smart meter SIM card, which is like the SIM card in your regular cell phone, but smaller — 5 by 6 millimeters — more durable and made of silicon, not plastic. Horn says the SIM, which can be connected to any of T-Mobile’s wireless networks, including 3G, can withstand the heat and environmental conditions of being outdoors in a smart meter much better than a standard SIM card. Network technologies including LTE, mobile WiMAX, WiFi and ZigBee potentially could be used for future smart grid applications. While it is still too soon to tell which technology is likely to become the big winner in this market, mobile WiMAX appears to have an edge over LTE due to mobile WiMAX's time-to-market advantage. Mobile WiMAX also has the advantage of being more reliable and secure than "pure" unlicensed technologies like WiFi. WiMAX can also count on support from leading companies like GE, Intel, Sprint Nextel, Clearwire, Motorola, Samsung and Google, among others. Most importantly, WiMAX will enable carriers, utility companies and other key players to build open-standards based smart meters. Ultimately, through WiMAX, third parties will be able to develop many applications and devices, helping to reduce cost. With WiMAX chipsets currently running about $36, some observers believe that the cost could become as low as $8 or $6 in the next 18 months. In the meantime, WiMAX-based smart meters are already available in the U.S. For instance, GE, in association with Intel and Grid Net software, has built one of the first WiMAX-based smart meters. Intel Capital and GE both invested in Grid Net in 2006. Companies competing with GE include companies like Trilliant, Itron, Silver Spring Networks (also one of GE's partners) and Landis & Gyr. However, over time, LTE could become a valuable option for many companies involved in this space as LTE becomes widely adopted and prices associated with it start to come down. LTE's larger coverage capacity and ability to support a higher number of points should play a key role here. In our opinion, it will also become critical for LTE carriers to offer a decent revenue share with utility companies and other key players. Although being a short-range technology, ZigBee could also have a role to play in the M2M apps space as several companies have expressed some interest in the technology. In fact, U.S.-based startup Tendril Networks is well positioned to become a pioneer in this space; the company, which teamed up with Itron and Landis & Gyr, has already developed a product called Tendril Residential Energy Ecosystem (TREE), compatible with various ZigBee-based devices to be used for smart grid apps inside homes. Lastly, if fully secured, WiFi could also become a disruptor. WiFi-based smart grid apps appear to be gaining traction in the U.S. and Europe. For instance, the city of San Jose, in association with Echelon, is currently testing a whole smart streetlight network using WiFi-based smart grids set to be launched this summer. The system may receive federal stimulus money, and if it does the city plans to revamp the entire 65,000-light network, which would help reduce energy costs by 40 percent. That figure is consistent with the performance of two European cities: Milton Keynes in the United Kingdom and Olso in Norway, which have been implemented by Echelon. But this also leads to a huge opportunity because now Telecoms can extend their reach into the Smart Grid through MTM (machine to machine) applications which will generate a much higher number of network connections. These may have less ARPU (i.e. average revenue per user) but a greater number of actual connections with no need to subsidise devices. Hence, they could be profitable. The Verizon Itron partnership is an example of such a service and this service will be a part of Verizon's LTE deployment in the 700 MHz band for M2M apps. On the services side, initiatives like Microsoft Hohm are being deployed and even if a utility isn't a part of Hohm, users can enter data directly which means that they can get more benefits the more they contribute to it.Google power meter is a similar initiative from Google. Thus, Smart grids, LTE and the Cloud are a huge opportunity for the industry - but the privacy concerns with sensor networks and the Cloud will play an important part here. Companies are building out the smart grid with various broadband technologies — cellular, WiFi, WiMAX — so why not good ol’ DSL? Smart grid sensor and software maker Current is touting a new smart grid partnership with DSL provider Qwest. Current largely provides the sensors that monitor different conditions on the electrical network, like voltage and current, as well as the software that processes the sensor information for the utility customer. While Current is mostly focused on the distribution portion of the grid, it can also provide communication gear and sensors for smart meters and in-home gateways, which it is doing for Colorado utility Xcel Energy for its SmartGridCity rollout. Because Current needs to get its information back to the utility, it works with a number of companies that provide that network connection. The latest is Qwest, which Current started partnering with, and is currently working with, for Xcel Energy’s SmartGridCity plan (Qwest provides phone and broadband service in Colorado). The buildout of SmartGridCity is supposed to be completed soon, followed by an assessment of the network’s benefits. What are the benefits of using DSL? Current’s senior vice president of business solutions, Mae Squier-Dow, says that because DSL is already widely available, using it speeds up the ability to deploy smart grid technology. And because the networks have already been built, she says, the option is more affordable for a utility than building out its own communications network. (Other companies argue that in the long run it’s cheaper to build and own the network). Since DSL is a proven technology, it can help smart grid projects gain access to stimulus funds meant for “shovel-ready” projects, Squier-Dow says. DSL is also high-speed, so if utilities want to use the networks for more bandwidth-intensive services, they can. And DSL is based on Internet Protocol, so it can more easily connect with other IP-based networks and systems, which are ubiquitous. Ultimately DSL is a standard that’s been used for years, so utilities can be rest assured that the technology is highly reliable.